Alabama beat Penn State in the 1978 Sugar Bowl. New eras in sports often carry a sense of liberation. Tennis was liberated in 1968 with the advent of the open era that allowed the world’s top professional players -- most notably Australia’s Rod Laver -- to compete in the Grand Slam tournaments. The Olympics followed suit in the 1980s and ‘90s as outdated ideas of amateurism gave way to making the best athletes in most sports eligible for the world’s preeminent athletic event. The landmark Title IX legislation of 1972 helped provide female athletes the same opportunities on the athletic field that had been available to men for decades. And, finally, college football throws off the shackles of the restrictive bowl system when the College Football Playoff kicks off Thursday with semifinal games at the Rose Bowl (Oregon vs. Florida State) and Sugar Bowl (Alabama vs. Ohio State). Considering that the No. 1- and No. 2-ranked schools (media poll) met only 11 times in bowls between the late 1930s and the dawn of the BCS era in 1998, college football fans are left to wonder what potentially terrific match-ups might have developed had a four-team playoff taken effect earlier -- much earlier. Imagine if college football administrators and coaches, motivated by the capacity crowds that jammed Madison Square Garden between 1943 and 1945 to watch the champion of the NCAA basketball tournament and the NIT winner meet in the Red Cross Benefit, had decided to match the winners of the top bowls. Football powerhouses with no-bowl policies such as Notre Dame and Army might have taken a few seasons to sign on. Also, the Big Ten and the Pacific Coast Conference, now known as the Pac-12, might have preferred to maintain their Rose Bowl arrangement. But by the early 1950s all the major conferences and independents were on board and the proto-College Football Playoff was ready. Here’s how a dozen muddled college football seasons could have played out differently. Howard Cassidy of the Ohio State Buckeyes. ​The muddle: Ohio State (10-0), led by fourth-year coach Woody Hayes, won the Associated Press media poll and defeated No. 17 Southern California in the Rose Bowl while UCLA (9-0) won the coaches poll and didn’t go to a bowl. Neither did No. 3 Oklahoma (10-0) nor No. 4 Notre Dame (9-1). With a playoff: There is no split national champion as matters get settled on the field. 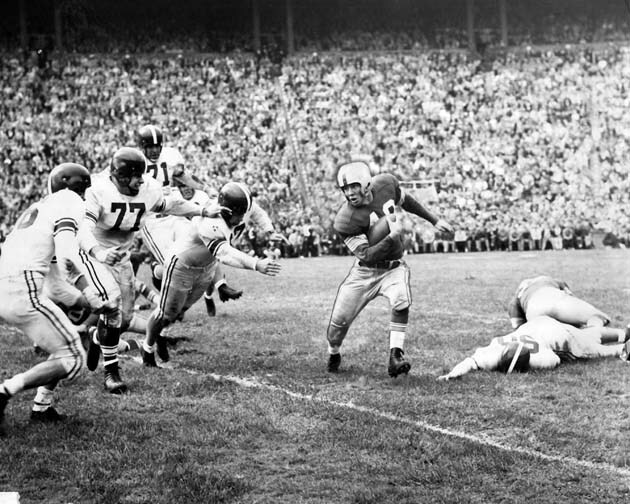 Ohio State plays Notre Dame in a semifinal matching future Heisman Trophy winners Howard “Hopalong” Cassidy and Paul Hornung, while UCLA meets coach Bud Wilkinson’s Sooners in the other semi. Footnote: This is the first of 11 split national champions with the media poll and the coaches’ poll choosing different No. 1 teams, the most recent coming in 2003. 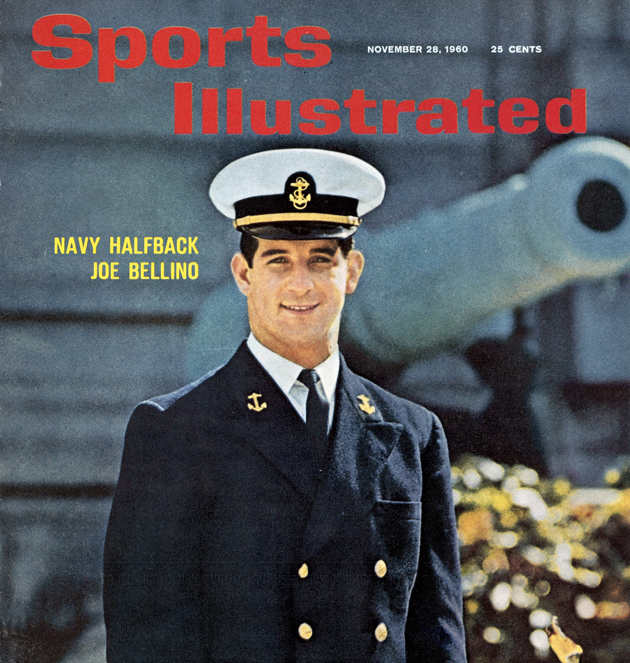 Navy's Joe Bellino on the Nov. 28, 1960 cover of Sports Illustrated. ​The muddle: It’s surprising that playoff talk didn’t begin immediately after this messy season. No. 1 Minnesota lost the Rose Bowl to No. 6 Washington; No. 2 Mississippi topped unranked Rice in the Sugar Bowl; and No. 5 Missouri defeated No. 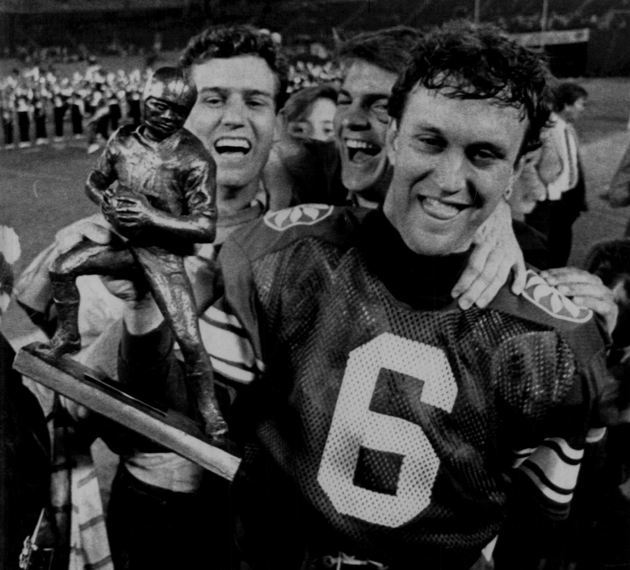 4 Navy and Heisman winner Joe Bellino in the Orange Bowl, although Bellino did make a spectacular over-the-head touchdown catch. No. 3 and Big Ten runner-up Iowa did not play in a bowl. Despite two losses in their final three games, the 8-2 Golden Gophers were considered national champions because there were no major polls after the bowls. The honor probably should have gone to Ole Miss (10-0-1), the only unbeaten team among the major conferences and independents. With a playoff: You think Baylor and TCU griped about this year’s playoff choices. Who gets left out of the ’60 field? Conference champions Minnesota, Ole Miss, Missouri and Washington all present strong cases as does independent Navy. The Midshipmen defeated Washington head to head so Navy most likely gets the call over the Huskies as No. 4 seed. Footnote: Among the 72,000 spectators at the Orange Bowl watching Missouri edge Navy 21-14 was a former naval officer who 18 days later would challenge a nation by saying, “Ask not what your country can do for you, ask what you can do for your country.” Until his death less than three years later, John F. Kennedy was regarded as Navy’s biggest fan. Alabama coach Paul Bear Bryant with QB Joe Namath (12). ​The muddle: Four teams claimed part of the national championship after one of college football’s most inconclusive seasons. Joe Namath-led Alabama (10-1), which lost the Orange Bowl to No. 5 Texas, topped both the media and coaches polls that concluded before the bowls. No. 2 Arkansas (11-0), the only unbeaten team among the major powers, beat No. 6 Nebraska in the Cotton Bowl and won national championship recognition from the Football Writers Association. No. 3 Notre Dame (9-1), led by Heisman quarterback John Huarte, had a no-bowl policy but was honored as the nation’s top team by the National Football Foundation. No. 4 Michigan (9-1), which routed No. 8 Oregon State 34-7 in the Rose Bowl, was judged No. 1 by the Dunkel System, an early form of Jeff Sagarin’s advanced metrics ratings. • THAMEL: Sugar Bowl preview: Will Ohio State surprise? With a playoff: No. 1 Alabama meets No. 4 Michigan, and No. 2 Arkansas plays No. 3 Notre Dame. Simple. Footnotes: One year later the AP media poll waited until after the bowls before conducting its final vote, a decision that benefited Alabama, the only bowl winner among 1965’s top four teams. And in Sports Illustrated’s 1965 college football preview, writer Dan Jenkins proposed a 16-team playoff. 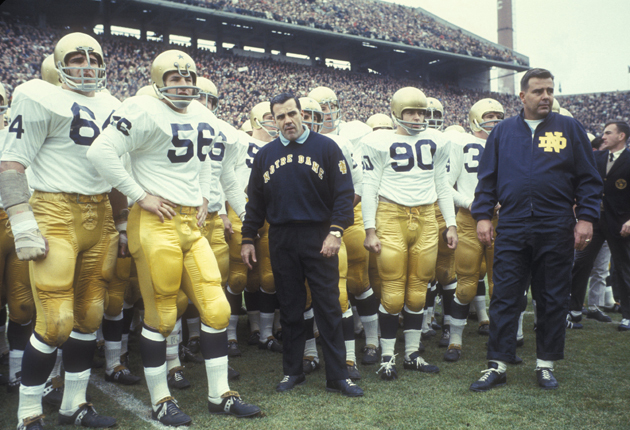 Ara Parseghian, head coach of Notre Dame, on the sidelines with team. ​The muddle: Talk about a lackluster bowl season. No. 1 Notre Dame (9-0-1) still had a no-bowl policy until 1969, No. 2 Michigan State (9-0-1) could not compete in the Rose Bowl’s due to the Big Ten’s hoary no-repeat rule and No. 5 UCLA (9-1) was passed over as Pac-8 Rose Bowl representative in favor of Southern California, whom the Bruins had defeated in their regular season finale. Two SEC schools that did not play one another, No. 3 Alabama (11-0) and No. 4 Georgia (10-1), easily won their bowls. With a playoff: Notre Dame and Michigan State, who had staged a titanic 10-10 tie Nov. 19 with loaded rosters that featured eight 1967 first-round draft picks, meet the best of the South in Alabama and Georgia—unless the playoff committee opts for UCLA over the Bulldogs. Footnote: Like a black hole, the ’66 Notre Dame-Michigan State battle sucked so much energy and luminance from the rest of the college football schedule—particularly the normally fever-pitched Michigan-Ohio State rivalry--that the Big Ten ruled all future regular-season conference schedules must conclude with intra-conference games. Notre Dame-Michigan State, subsequently, has been played in September or October. 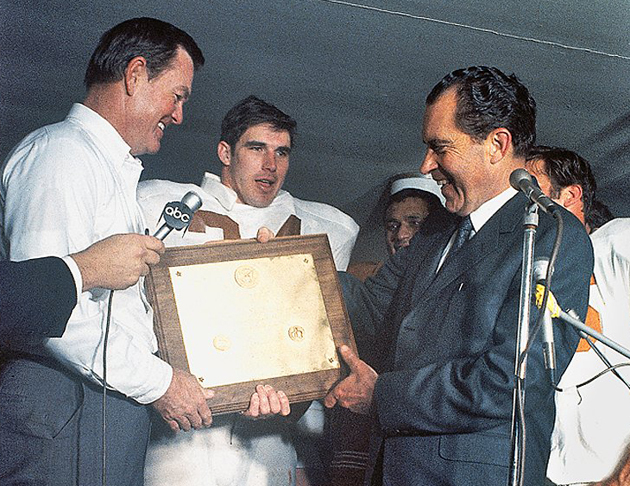 President Richard Nixon (right) presents Texas coach Darrell Royal (left) with plaque. ​The muddle: The top three teams, Texas, Penn State and USC, went to different bowls and all were victorious. The Longhorns, with an assist from President Richard Nixon who presented Texas with a national championship plaque at the end of the regular season, received the No. 1 nod over the Nittany Lions even though both finished 11-0. Southern California, which played perhaps the toughest schedule of the three, had only a 14-14 tie vs. Notre Dame at South Bend marring its 10-0-1 record. With a playoff: Texas, Penn State and USC grab the top three seeds with the playoff committee deciding between Notre Dame (8-1-1), Big Eight champ Missouri (9-1), and Arkansas (9-1), a one-point loser to Texas, as the fourth team. Footnote: Texas, the last all-white team to win a national championship, relied on a wondrously gifted black quarterback to win its next consensus title in 2005 when Vince Young led the Longhorns to a 13-0 record. Notre Dame Art Best (23) rushing vs Alabama at the Sugar Bowl. ​The muddle: On the surface, 1973 appeared clear-cut with No. 2 Notre Dame (11-0) upsetting No. 1 Alabama (11-1) in the Sugar Bowl 24-23 to claim the national title. But as Florida State showed this past season, not all undefeated teams are created equal. The Fighting Irish played a somewhat soft schedule in ’73, including Northwestern, Rice, the major three service academies and a sub-.500 Miami team. The nation’s top squad might have been Oklahoma (10-0-1) but the Sooners were on bowl probation due to a series of recruiting violations. The Big Ten featured unbeaten behemoths Ohio State and Michigan, who fought to a 10-10 tie in the season finale. Big Ten athletic directors, in a highly controversial vote, awarded the Rose Bowl bid to the Buckeyes who then battered USC 42-17 in Pasadena and finished the season 10-0-1, good for No. 2 in the final media poll. Oh, yes. Penn State, then an independent with Heisman-winning running back John Cappelletti, went 12-0. With a playoff: Notre Dame, Alabama, Ohio State and either Michigan or Penn State make for a powerhouse tournament. Footnote: The 1973 season marked the last time the coaches’ poll concluded before the bowls, giving Alabama a dubious piece of the ’73 national title. 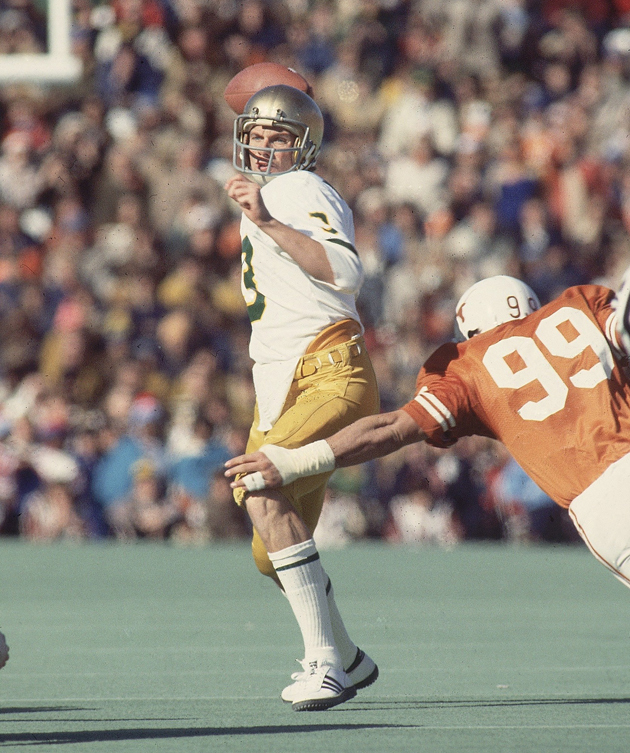 Notre Dame QB Joe Montana (3) making pass vs Texas Steve McMichael (99). ​The muddle: No. 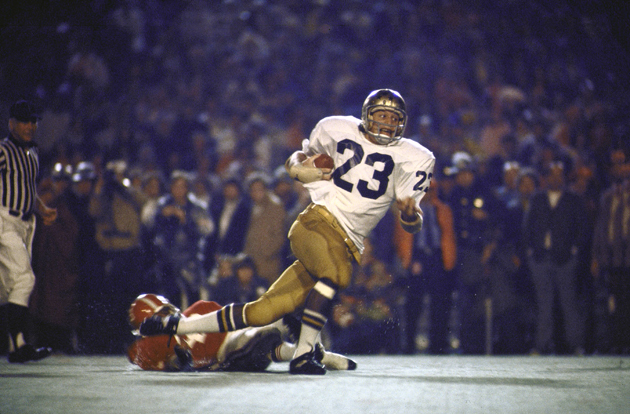 5 Notre Dame (11-1), led by Joe Montana, pounded No. 1 Texas in the Cotton Bowl to win the national championship, jumping No. 3 Alabama (11-1), which had destroyed No. 8 Ohio State in the Sugar Bowl. How did the Irish get to play the top-ranked Longhorns? Alabama, as SEC champion, was obligated to the Sugar Bowl. No. 2 Oklahoma, the Big Eight winner, was contracted to play in the Orange Bowl—where it lost to coach Lou Holtz’s No. 6 Arkansas Razorbacks. Crimson Tide fans still haven’t forgiven poll voters for 1977. With a playoff: Texas, Oklahoma and Alabama are in with either No. 4 Michigan or No. 5 Notre Dame grabbing the final spot. In other words, a 1977 College Football Playoff might not have included the Fighting Irish, the eventual ’77 champion. Footnote: Alabama’s 35-6 Sugar Bowl wipeout of Ohio State marked the only time coaching legends Bear Bryant and Woody Hayes faced off, and their careers sped quickly in opposite directions. Bryant won national championships in 1978 and ’79 while Hayes’ 29-season tenure in Columbus came to an abrupt end when he punched a Clemson player toward the end of the 1978 Gator Bowl and was fired. The muddle: Alabama (11-1) won the media poll while Southern California (12-1) topped the coaches’ poll. In the Crimson Tide’s favor was a 14-7 win over No. 1 Penn State in the Sugar Bowl. Favoring the Trojans was a 24-14 head-to-head victory over Alabama in Birmingham. Then there was Oklahoma (11-1), the No. 1 team until a late-game fumble by Heisman winner Billy Sims against Nebraska cost the Sooners a perfect regular season. With a playoff: Alabama, USC and Penn State take the top three seeds with the playoff committee picking among Big Eight co-champs Oklahoma and Nebraska, and Big Ten winner Michigan for the No. 4 slot. Footnotes: In a rare bowl rematch, Oklahoma topped Nebraska 31-24 in the Orange Bowl and finished No. 3 in both polls. 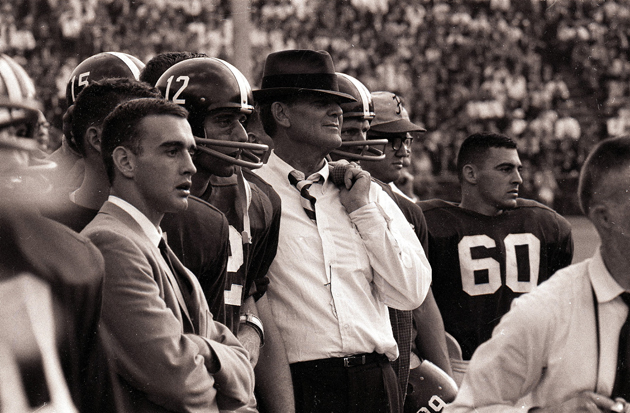 Of Bear Bryant’s six national titles only two (1961 and 1979) did not include a split championship or a bowl defeat. BYU Cougar QB Robbie Bosco (6) after winning the Most Valuable Player trophy in the Holiday Bowl. With a playoff: BYU tests its mettle against a field that includes Washington, Oklahoma and either Ohio State or South Carolina. Footnotes: BYU’s championship may be suspect, but Cougars quarterback Robbie Bosco’s grit is not. Bosco overcame an injured knee to throw for 343 yards and lead two fourth-quarter touchdown drives in the 24-17 Holiday Bowl victory. And although Washington could have benefited greatly from an extra round of games, Huskies coach Don James was an adamant opponent of a college football playoff. 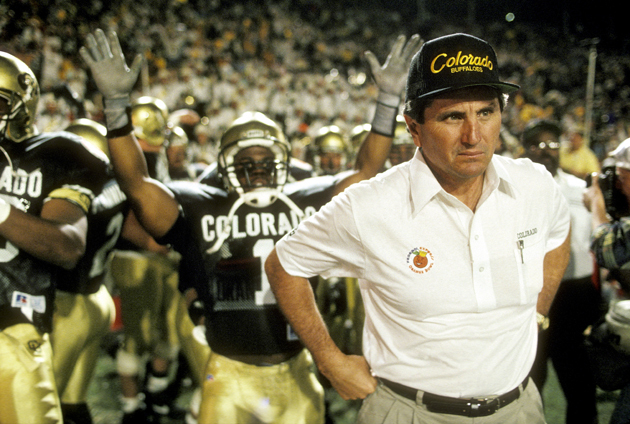 Colorado head coach Bill McCartney on sidelines with team before game vs. Notre Dame. ​The muddle: Colorado (11-1-1) won the media poll while Georgia Tech (11-0-1) was the coaches’ choice for No. 1. Most frustrating was the teams could have met in the Orange Bowl to give college football an undisputed national champion. But Orange Bowl officials preferred the proven box office qualities of twice-beaten Notre Dame to serve as the Buffaloes’ opponent in Miami. Colorado held on for a 10-9 victory while Georgia Tech, relegated to the Florida Citrus Bowl, pounded Nebraska, 45-21. With a playoff: Colorado and Georgia Tech are joined by Cotton Bowl foes Texas and Miami (the Hurricanes crunched the Longhorns, 46-3) or possibly Florida State. Footnote: Georgia Tech’s exclusion from the major bowls sounds surprising in 2014, but in 1990 the ACC was not considered big league. Florida State, Miami and Virginia Tech had yet to join the conference and the only other ACC teams ranked in the Top 25 were No. 9 Clemson and No. 23 Virginia. 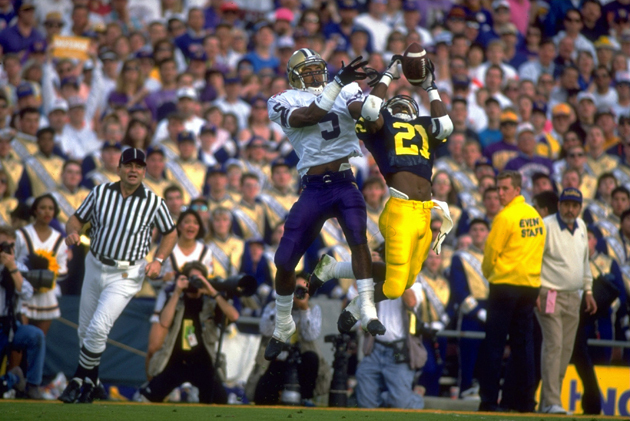 Michigan Desmond Howard (21) making catch vs. Washington Dana Hall (5). ​The muddle: College football featured co-champions in consecutive seasons for the first time as 12-0 Miami (media poll) and 12-0 Washington (coaches’ poll) shared honors. Alas, the two could not face off as the Huskies were obligated to play No. 4 Michigan and Heisman winner Desmond Howard in the Rose Bowl, while the Hurricanes could play in any bowl but the Rose. Washington hammered Michigan 34-14, while the ‘Canes dominated No. 11 Nebraska 22-0 in the Orange Bowl. A Sugar Bowl matchup vs. No. 3 Florida might have made more competitive sense. With a playoff: Miami and Washington probably settle matters head to head with Florida and Michigan filling out the semifinal brackets. Footnote: Back-to-back split national champions convinced college football officials to form the Bowl Alliance, an agreement by the Sugar, Fiesta and Orange Bowls to match the two top-rated teams outside the Big Ten and Pac-10. In 1998 the Rose Bowl came aboard to form the Bowl Championship Series (BCS), which continued through the 2013 season. 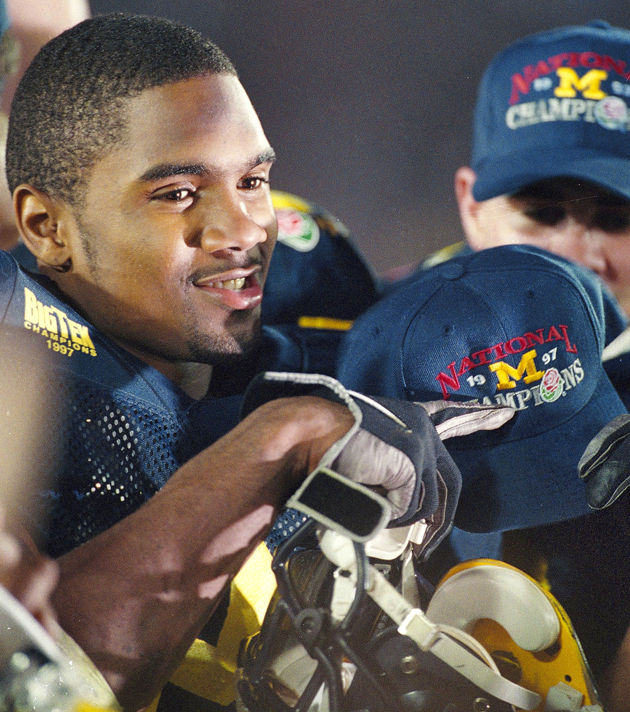 Michigan DB Charles Woodson after 1988 Rose Bowl. ​The muddle: In the final season before the BCS kicked in, Michigan (12-0) and Nebraska (13-0) shared the national championship after the Wolverines beat No. 8 Washington State 21-16 in the Rose Bowl, and the Cornhuskers devoured No. 3 Tennessee and Peyton Manning 42-17 in the Orange Bowl. Michigan, which featured Heisman winner Charles Woodson playing defense, offense and returning kicks, had led both the media and coaches’ polls prior to the bowls. Sentiment began building for Nebraska, however, when word spread that longtime Huskers coach Tom Osborne planned to retire at season’s end. Nebraska edged Michigan by four points in the final coaches’ vote. With a playoff: Top seeds Michigan and Nebraska are joined by Tennessee and Florida State, the Sugar Bowl winner. Footnotes: In early 2014, Lloyd Carr, who coached Michigan from 1995 to 2007, said he was still “extremely bothered” by the final ’97 coaches vote, particularly because one coach voted the Wolverines No. 4 and two others put them No. 3. Had these three coaches voted Michigan No. 2, the Wolverines would have won both polls. And Scott Frost, Nebraska’s quarterback in ’97, seeks another national title this season as Oregon’s offensive coordinator.